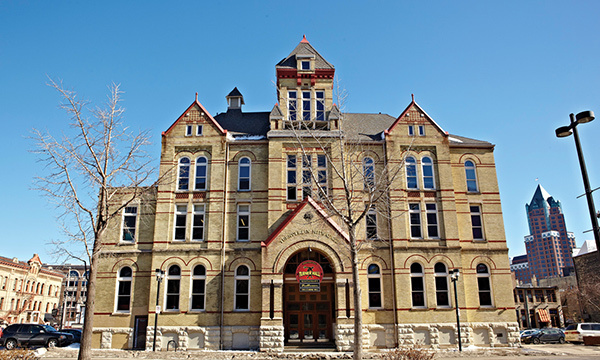 In the mid-1990s the directors of the Milwaukee Turners, Inc., faced momentous decisions regarding its 1882 clubhouse downtown. The Turners, founded in 1853, were Milwaukee’s oldest civic organization, with an motto of a “Sound Mind in a Sound Body.” The problem is, the Turners were not housed in a sound building. Ceilings leaked, the foundation had been compromised by a declining water table, the plumbing, wiring and facilities in general were inadequate. To say that there was deferred maintenance would be an understatement: There was the matter of fire damage in the upstairs ballroom, dating to 1933 and 1941, which had yet to be repaired, more than 60 years after the conflagrations. Numerous violations were issued by the city, any number of which were so serious that the future of the building itself was uncertain. The expert consensus was that the 15,000-square-foot property, located across the street from the Bradley Center, would make a fine surface parking lot. The Turners thought otherwise, and with considerable effort and expense were able to save the building. Changes included a substantial remodeling of the first floor restaurant and bar, including new fixtures such as modern plumbing and ventilation. 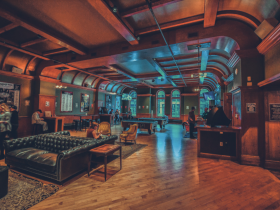 Upstairs, the ballroom was restored, also with new plumbing, thanks to the efforts of Uihlein Wilson Architects, whose principal, David V. Uihlein, Jr., was the son of Jane Bradley Pettit, the donor of the Bradley Center just across the street. The ballroom work, including an elevator, was completed around 2007, and, now under the management of the Pabst Theater Group, is a resounding success, and has hosted countless concerts and public events since then. The frugal Turners resisted the urge to restore the hall to its Victorian era grandeur, instead concentrating on the mechanical systems. No problem: the faded glory of the room suited patrons just fine. The Turners hoped that the first floor restaurant would benefit from the activities at the Bradley Center. They were only partially correct, since the operator, most recently Major Goolsby’s, only partially opened the restaurant for business, and usually only during sporting events at the Bradley Center. The bar, located at the entrance, was one of the most impressive in the city, and at the same time one of the most forbidding, since it was located behind an iron fence. This community gathering place was sending mixed messages. The Turners looked for somebody to make better and fuller use of the restaurant, and this July signed a contract with Mike Eitel to take over the space, and to run it with more consistent hours and amenities. Murals. Photo by Michael Horne. Eitel is the operator of the Nomad (in Milwaukee and Madison), and ran this summer’s popup Nomad Nacional in Walker’s Point. He has a reputation for rapid remodeling of his taverns, figuring that the sooner the cash register begins to ring, the better. Eitel lightened the interior by removing much of the Turner memorabilia that had decorated the walls, and returning it to the organization. So, gone are many of the trophies, photos and mementos of the long-dead. 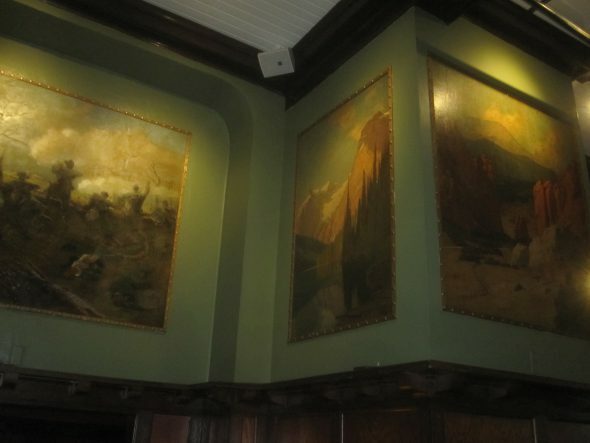 Fortunately, the tavern’s murals, executed in Milwaukee by the famed diorama painters, who socialized in this building, remain. Eitel chose “The Tavern at Turner Hall” as the name for the place, emphasizing the importance of the building as an institution, and of its bar as a representative of Milwaukee’s fabled drinking culture. Of course, taverns are not often as large as 10,000 square feet in size, as this place is, so there is some effort involved in evoking a cozy Bierstube within the confines of a vast hall. Having potential customers confront an iron fence, however attractively built, as their first impression, was not conducive to the comfy feeling of a Milwaukee bar. The barrier went, and with its departure, a certain uncomfortable vibe disappeared. 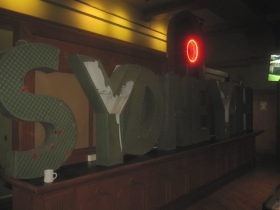 The Palm Garden on the south of the hall was converted into a lounge space, with sofas, tables (including three pool tables) and other amenities, along with the iconic SYDNEY HIH sign that once was atop a building up the street, now lost. There are non-electronic darts, and a shuffleboard in the room, all with plenty of space for players. Tufted black leather couches invite casual conversation. It’s hard to imagine you are in a room the size of a hangar. 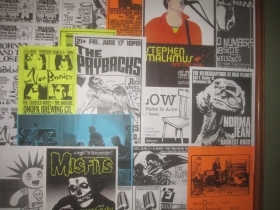 Eitel also sought to connect the place to Milwaukee’s rock’n’roll history by soliciting contributions of old posters from bands that had performed in the city over the years. This is an ongoing project, and adds a new layer of history to the old building. By October 3rd, the doors were open once again, and for once, on a regular basis. As crews began to demolish the Bradley Center, this building across the street, a century older, survived. Will it thrive in a new era, with a new arena a few blocks north? Will there be a renaissance west of the river? 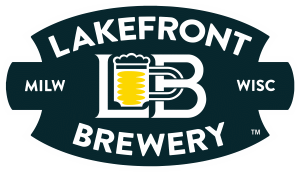 The Milwaukee Bucks, the Milwaukee Turners and Mike Eitel all hope so. Open 7 Days A Week. Photo by Michael Horne. In addition to the bar posters, there is some other signage of significance here, like one offering deals on drinks. Nomad patrons will recognize that that tavern’s fabled Happy Hour has been adopted here. It runs Monday-Friday, on a very precise schedule. From 4-4:19 p.m., drinks are $1. From 4:20-4:39 p.m., the joint sells them for $2. From 4:40-5 p.m., drinks are only $3. Another sign must be heartening to the Turners, who long had hoped that their building would operate on a regular schedule. “OPEN 7 DAYS A WEEK,” it reads. 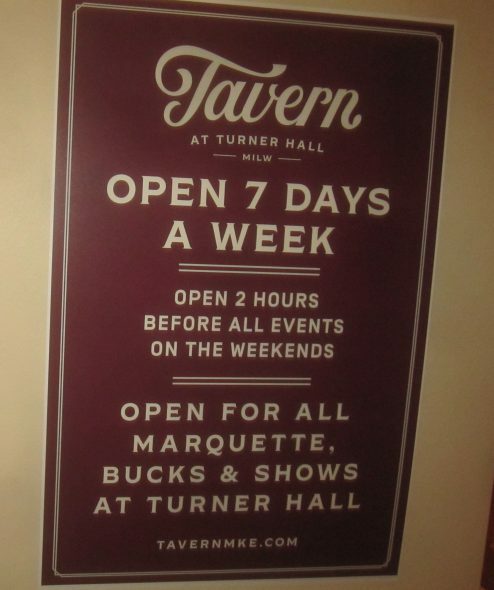 The Tavern at Turner Hall will be open “Before, During and After” all Marquette and Bucks games, as well as all shows at Turner Hall Ballroom. “For over 10 years she has goaded us and guided us, cleaned up after us, kept us going and held us accountable to our Principles and Mission!,” reads an invitation from the Milwaukee Turners announcing a celebration of the work of Katharina Hren, who has operated the non-profit while furthering her studies in Yoga and peacemaking, which she plans to pursue in the future. 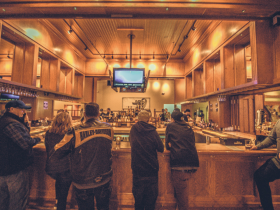 Hren juggled the responsibilities of the organization, along with its many components, which finally include a bar with a regular hours of operation. 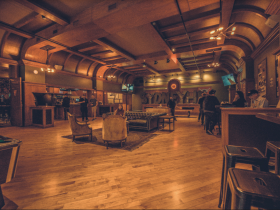 “We wil be gathering after 5:00 this Friday in Mike Eitel’s great new Tavern at Turner Hall and hanging around eating, drinking and Turner Talking until Kat goes upstairs to the 8:00 [Stephen Marley] concert in the Ballroom, which she knows so well! A committee has been formed to recruit a new Executive Director for the Milwaukee Turners. More information can be found here. Tavern at Turner visitors who are also familiar with the ballroom will be happy to know that House Manager Al Godshaw will still be present to greet concertgoers as he has been for over 2,000 shows since 2007. The affable retired educator will still have pretzels to hand out, but now he won’t have an iron fence behind him. Here is a Radio Milwaukee interview of Al by Nate Imig from 2017. Building Owner: Milwaukee Turners, LLC. Fun to see a DG&G poster (circa early 1980s) in the lower right-hand corner of the Tavern’s “rock’n’roll” collection. It was great to meet you at the party for the advent of the HOP at Taylor’s. Keep writing love letters to our loveable city.